You need a clear direction as to where you’re going with regard to your project before you start doing. This is to ensure that everything is going according to plan. For that reason, you need to come up with a thorough strategy as to how you want to approach the roof upgrade project. You can do this by thinking about the issues you’re having and how to deal with those challenges. Is there any glaring damage that needs to be repaired first? Is the energy efficiency level of your home reduced by the roofing options? Is the roof still in good condition or does it need a complete replacement? These are the questions that you have to ask yourself to find out the scale of the entire project, and the answers will give you a better scope of understanding as to how you should approach the task. Once you have a clear idea of what you need to do, the next thing you should consider is the budget. Before doing the research, it may be a bit difficult to understand how much you will need to spend on the project. Therefore, you will need to look for professional estimates. One of the best ways to do this is by talking to a contractor to see how much they will charge you for and what services they can do for you. You may not plan to hire them, but doing this is a good way to know how to approach the project and figure out how much money you will be spending. 3. 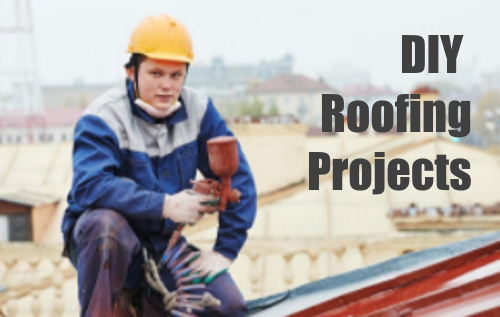 Use high-quality equipment and materials quality of the entire roof improvement project depends on the quality of the materials and the equipment you use. Don’t be fooled into thinking that all the materials and equipment is the same, as they are absolutely not. The best quality products can save you a ton of money by increasing energy efficiency, and they can make your home a lot more comfortable as well. High-quality tools can help to make the entire project go by much faster, and it will help to guarantee a higher quality finish as well. The best approach to any home upgrade project is to focus on one thing at a time, and the same is true for a roofing project as well. If you divide your attention onto doing several things at once, the project may not go in the same direction. In fact, it may even slow the process. Instead, you should get one thing done at a time to ensure the best quality while maintaining a constant speed. DIY home repair projects, especially ones that involve building an additional part to the home, require permission from the local county. You need to make sure that your DIY project is legal so that you don’t run into any issues later on. Talk to your local administrative offices to learn more about the home renovation regulations so that you don’t accidentally violate the law. DIY projects can be highly rewarding, and we encourage you to do it if you are capable. However, if you find yourself slightly out of your league, All-Star Roofing will be here for you. We can give you professional consultation on anything roofing-related so you can be sure that you’re headed in the right direction. Call us today and see what we can do for you.